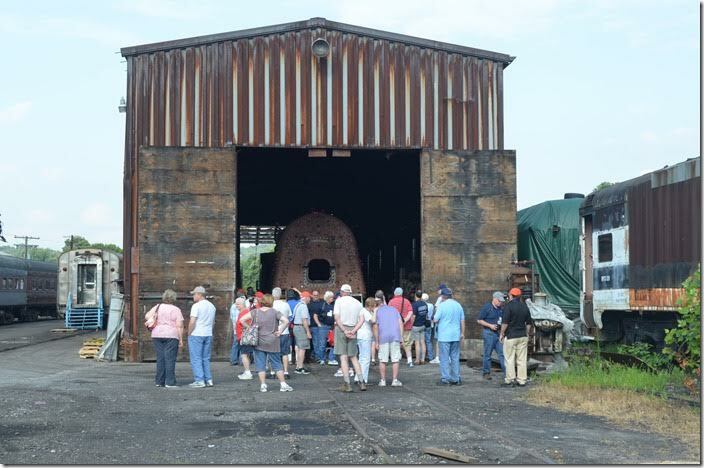 On Friday afternoon, July 29th, C&OHS members convened at the former Western Maryland Ry. 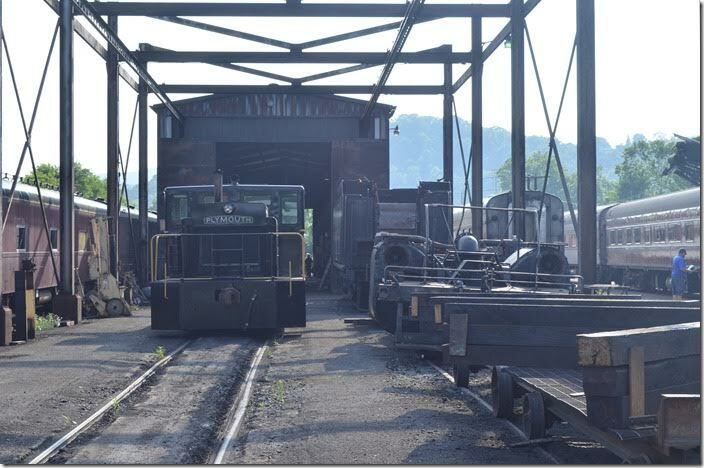 depot in Cumberland MD for a chartered run up toward Frostburg followed by a tour of the shop complex across the river in Ridgeley WV. 1. 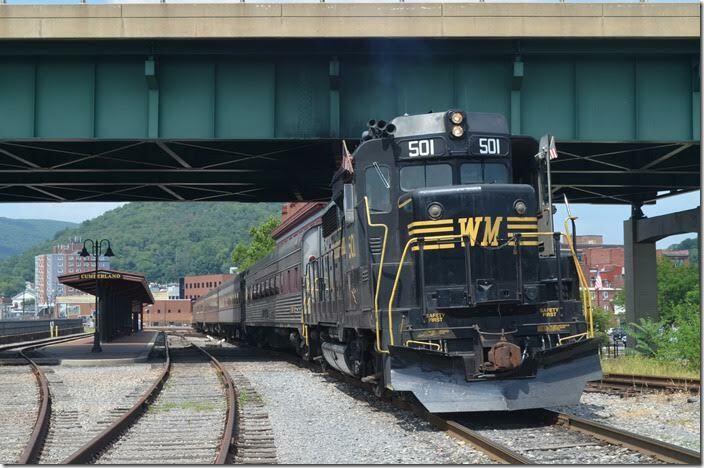 WMSR 501 ready to depart Cumberland MD with our C&OHS group. It will push up up the grade toward Frostburg. Cumberland MD. 2. WMSR 501. Cumberland MD. View 2. 3. 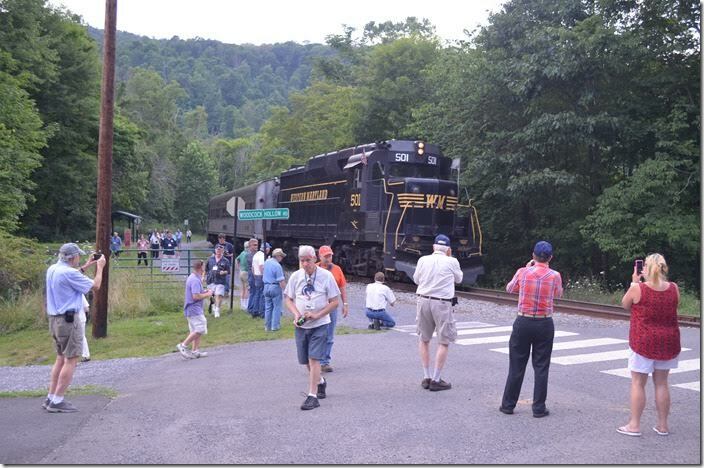 GP30 501 is ex-Conrail, exx-Penn Central and nee-Pennsy. 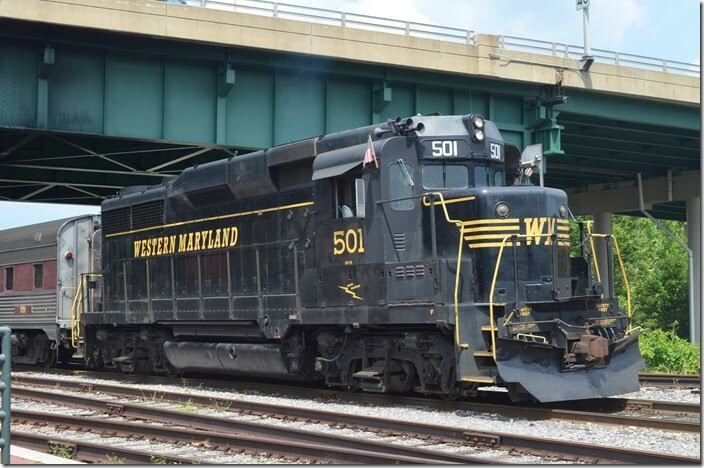 Western Maryland had GP35s but no GP30s. 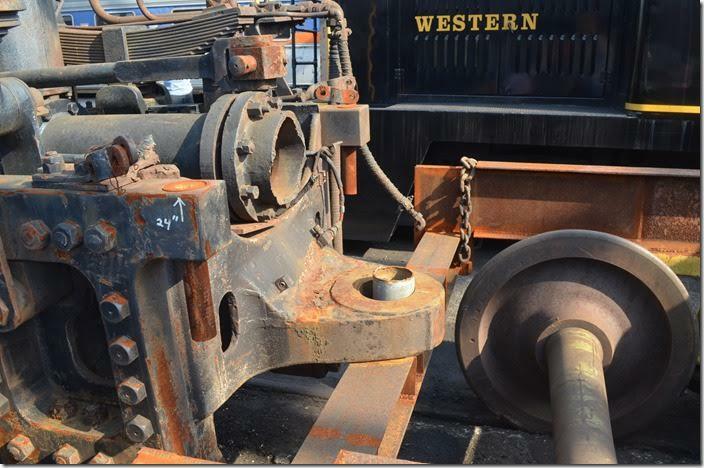 WMSR GP30 501. Cumberland MD. View 3. 4. We backed as far as Woodcock Hollow Rd. which is up on the hill near Mount Savage. The track is blocked by a slide and mine subsidence between here and Frostburg. A WMSR official told me that local government was arranging for the work, and he didn’t know when it would be done. You can bet the old WM would have had this crucial main line opened within a few days. 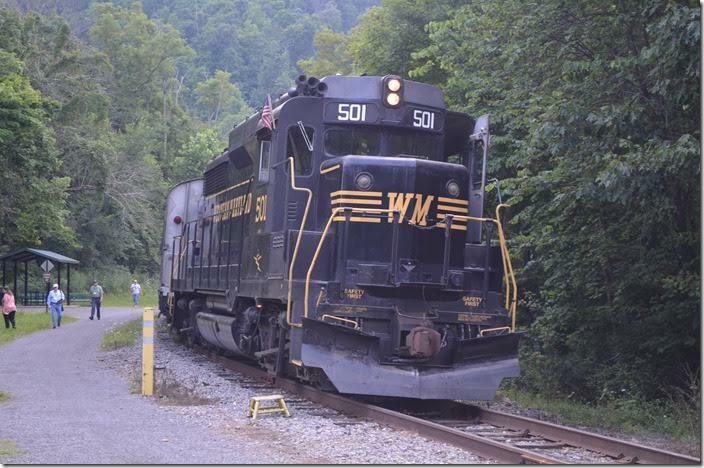 WMSR 501. Mt Savage MD. 5. 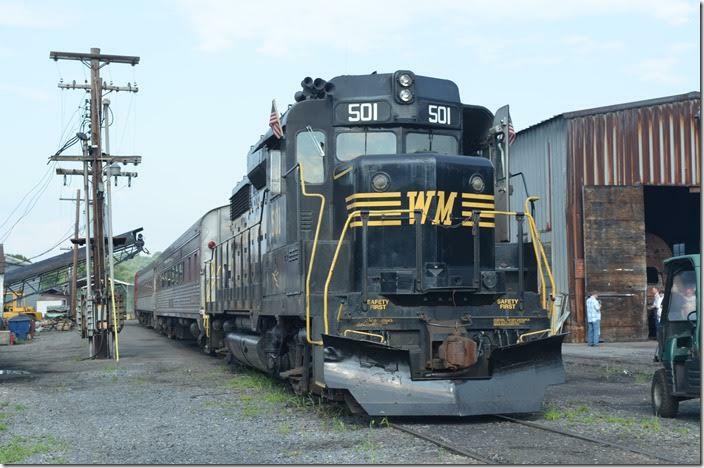 WMSR 501. Photo Op. Mt Savage MD. View 2. 6. WMSR 501. Mt Savage MD. View 3. 7. 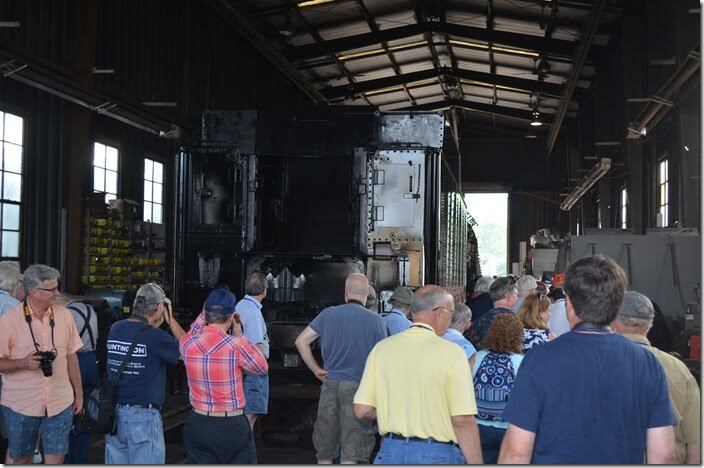 Of course all these C&O fans were curious about the restoration of 2-6-6-2 1309. 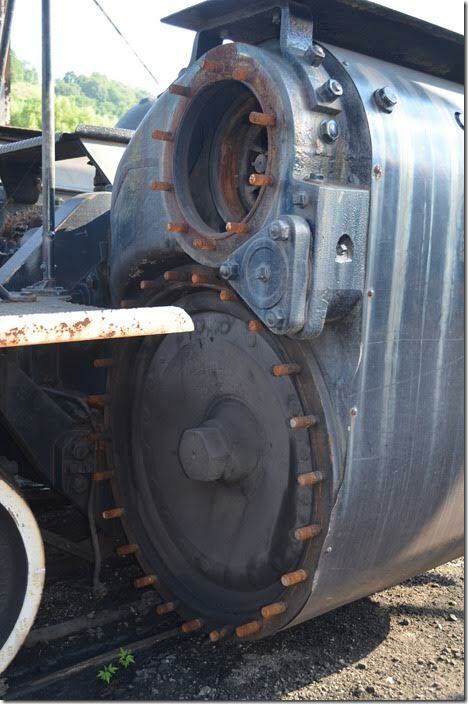 This is the stoker screw on the large rectangular tender used on 2-8-0 734. 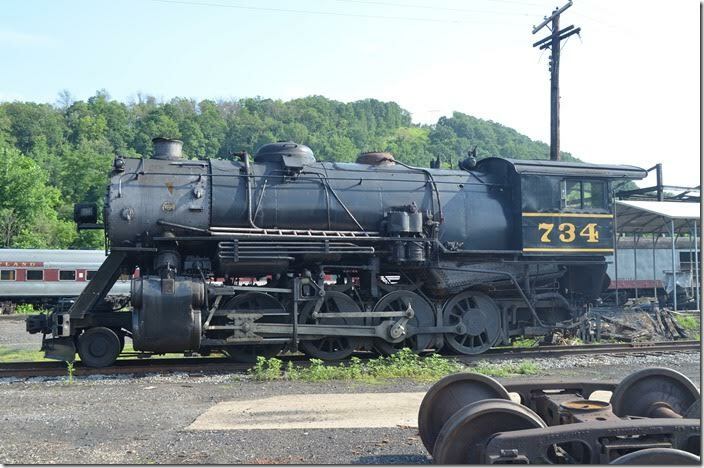 WMSR 734 tender stoker. 8. 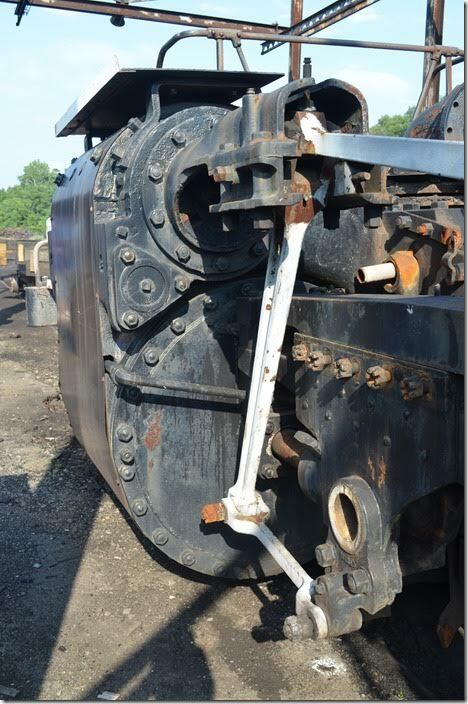 The front running gear of WMSR 1309. 9. 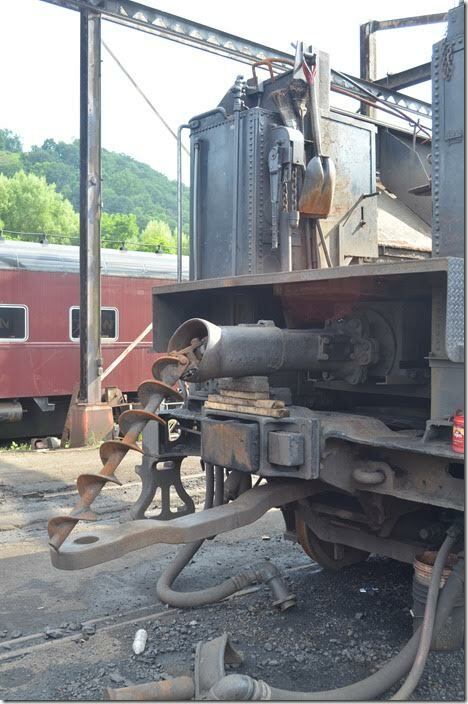 The front running gear of WMSR 1309. View 2. 10. 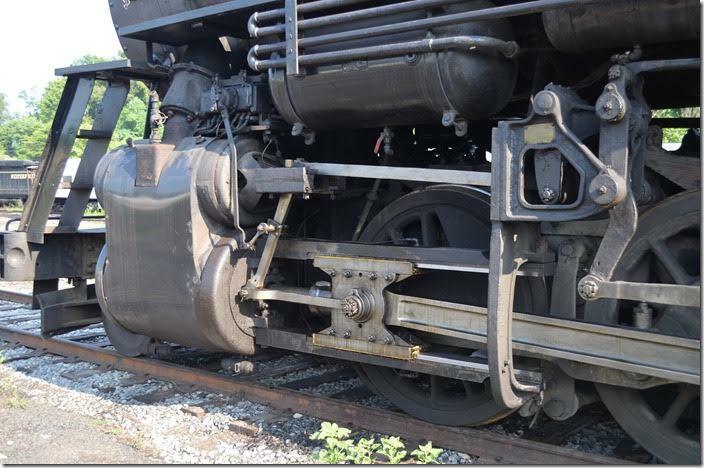 The connection between the front and rear set of drivers on WMSR 1309. View 3. 11. WMSR 1309. View 4. 12. 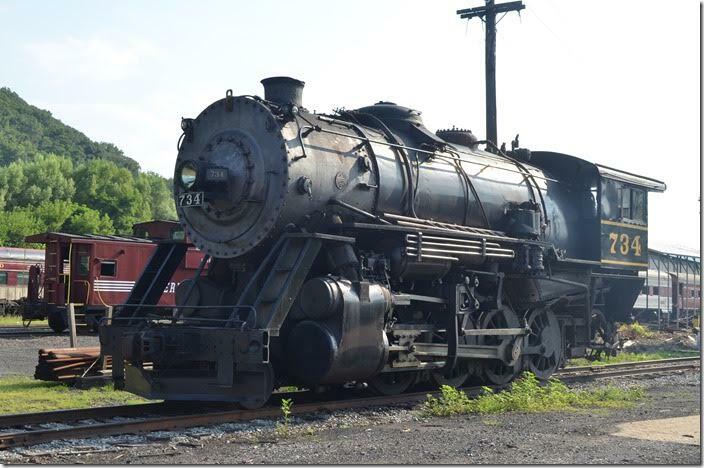 That’s a big tender for a Lake Superior & Ishpeming 2-8-0! I don’t know its origin. 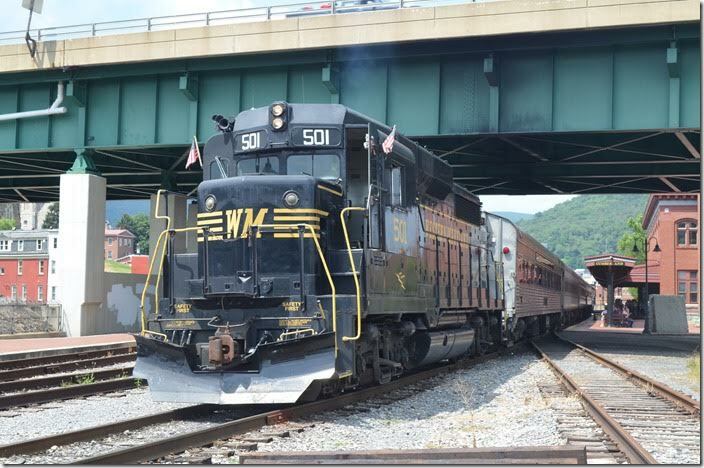 Looks good as a WM tender. 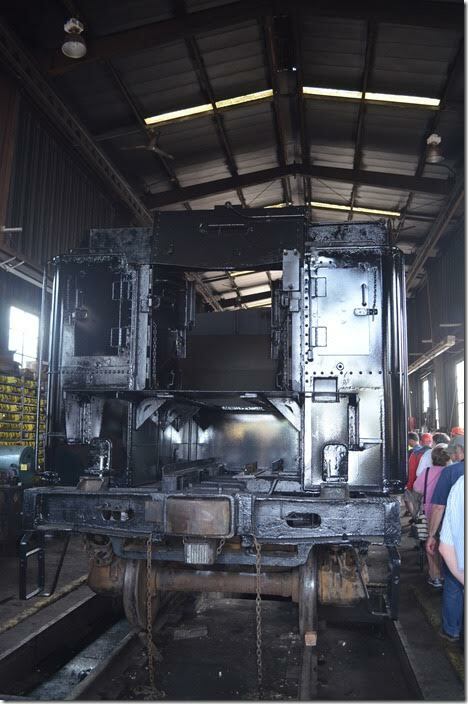 WM used big 6-axle rectangular tenders on their giant H-9 2-8-0s. 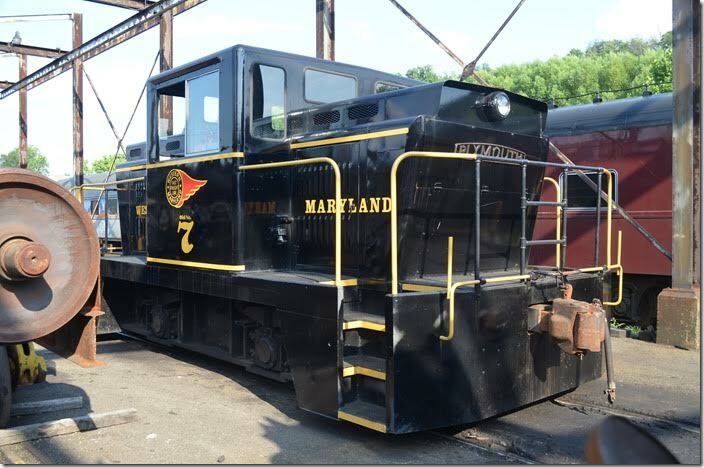 WMSR 734 tender. 13. 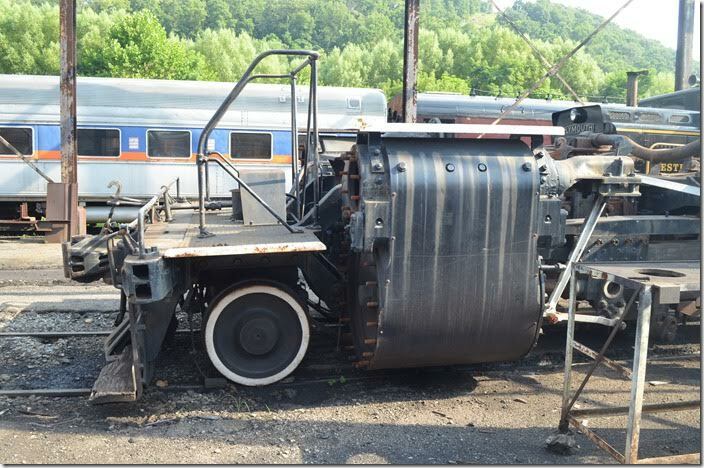 C&O 1309’s tender has been repainted. 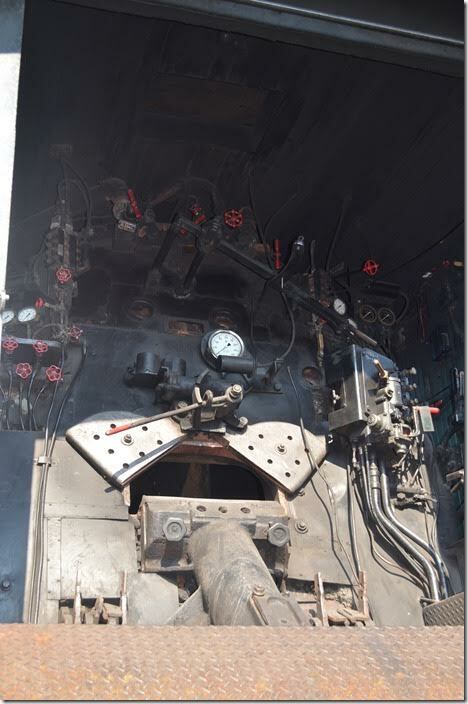 WMSR 1309 tender. 14. 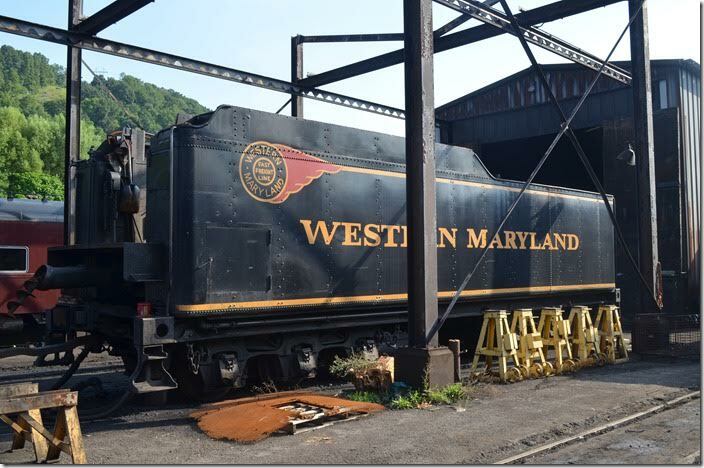 WMSR 1309 tender. View 2. 15. 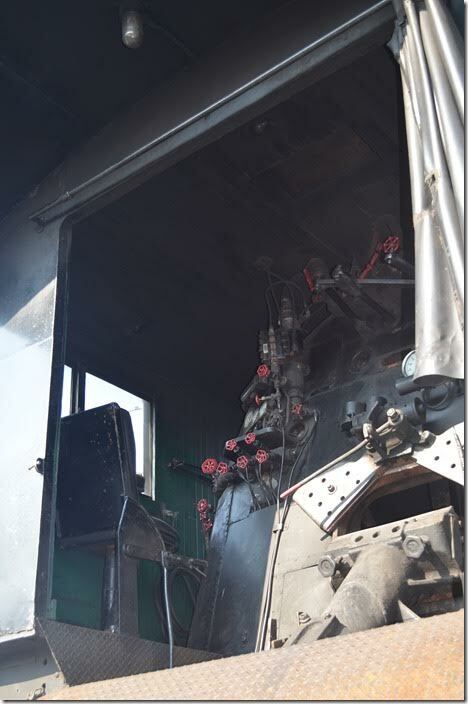 Smoke box and flues of WMSR 1309. View 3. 16. WMSR 1309. View 4. 17. WMSR 1309. View 5. 18. WMSR 1309. View 6. 19. I think this is the former WM car repair shop. WMSR shop. 20. 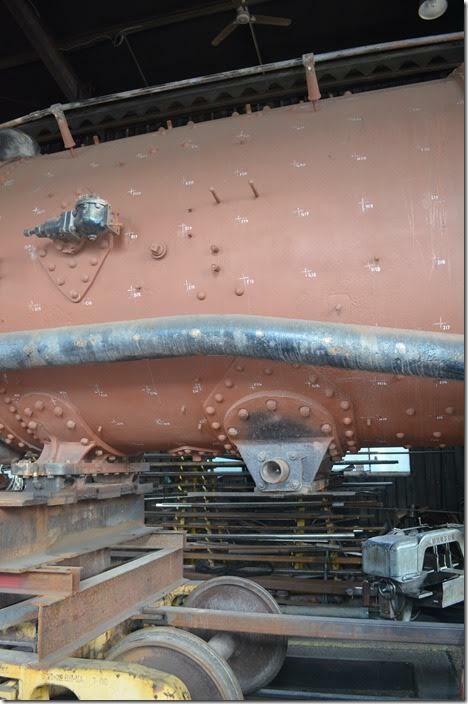 The conveyor for coaling the steam locomotives is in the background. WMSR 501. Ridgeley WV. 21. 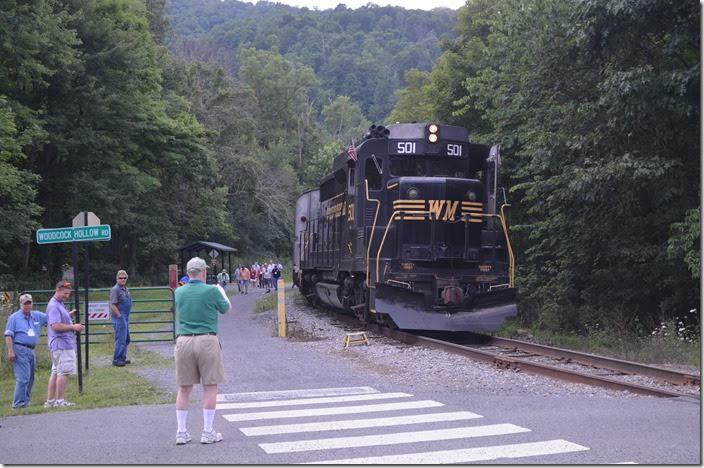 I read where WMSR had three cabooses, two of which are ex-C&O. I don’t have their former numbers. 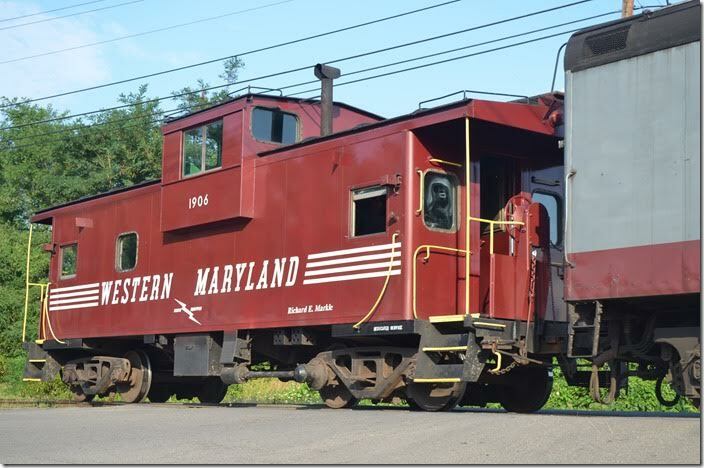 WMSR caboose 1906. Ridgeley WV. 22. 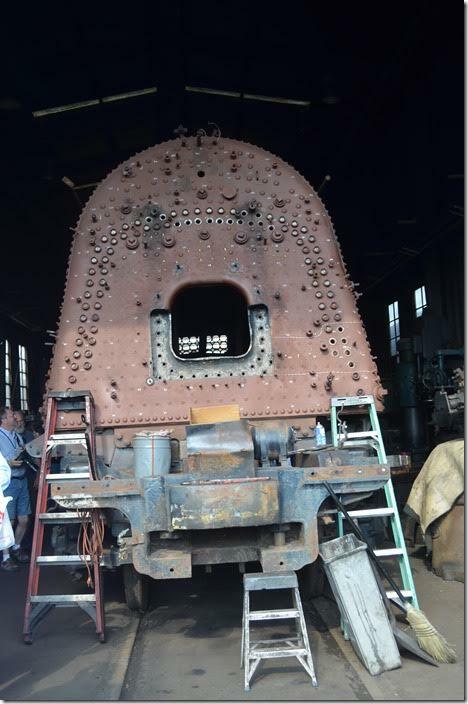 WMSR 734 is down for her 15-year maintenance work. 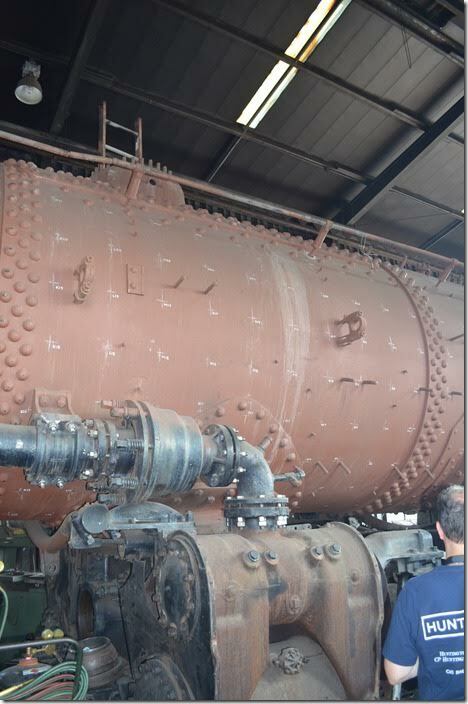 Doesn’t look like anything has started, as 1309 fills up the shop. 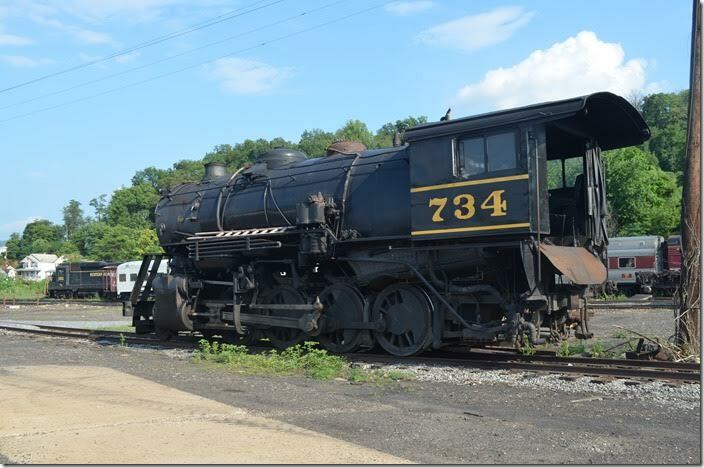 WMSR 734. 23. 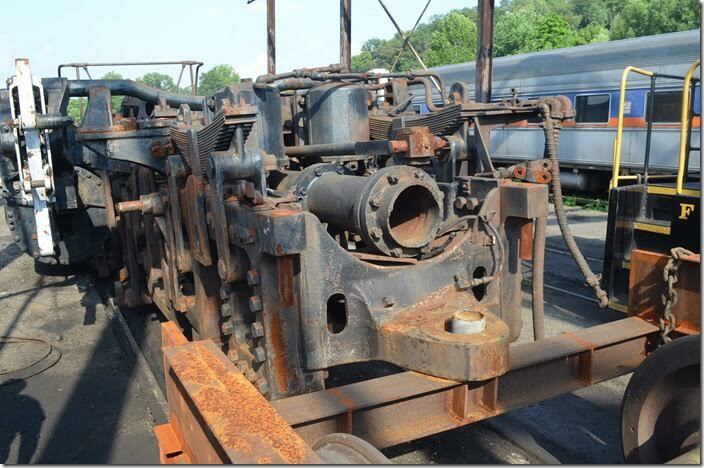 That’s WMSR GP30 502 in the background. WMSR 734. View 2. 24. 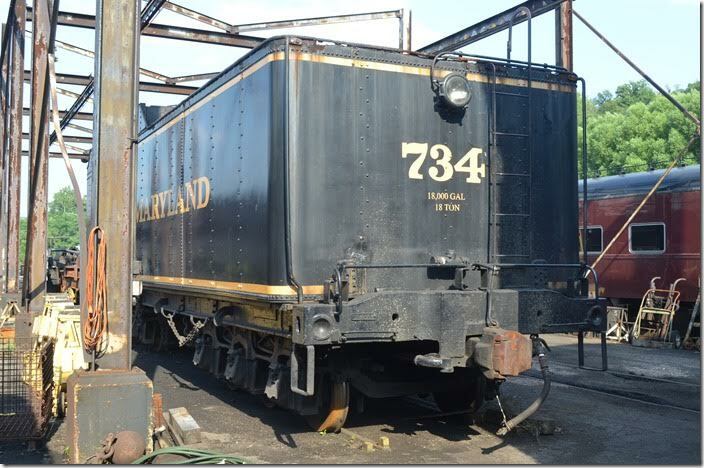 734 looks very similar to a WM H-7 or H-8 2-8-0 which were built about the same time. WMSR 734. View 3. 25. Built by Baldwin Locomotive Works in 1916 for the Lake Superior & Ishpeming, an iron ore hauling short line out of Marquette Mich. WMSR 734. View 4. 26. WMSR 734. View 5. 27. WMSR 734. View 6. 28. 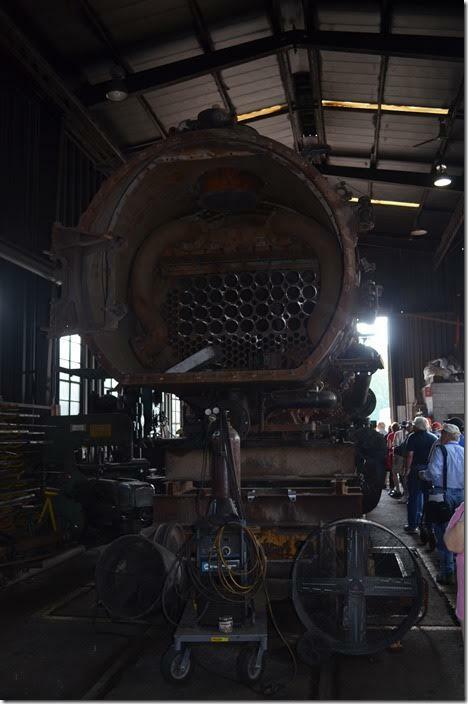 This engine was only a couple of builder’s numbers from 734. I have a photo of LS&I 35. 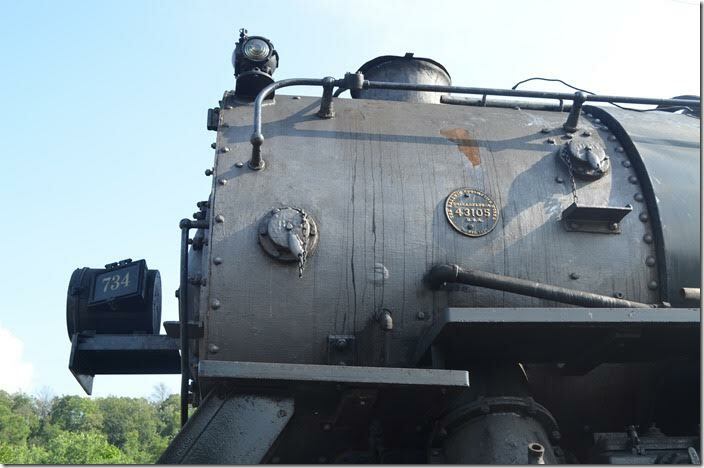 Like 33 it was equipped with a tender booster. Perhaps 34 had one too. 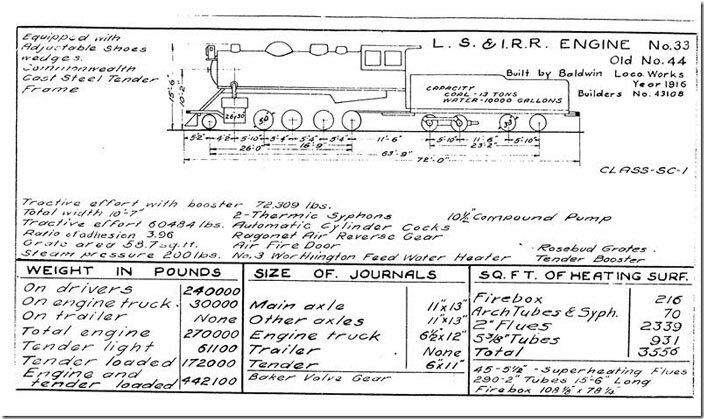 LS&I sheet 001. 29. WMSR 734. View 7. 30. WMSR 734. View 8. 31. 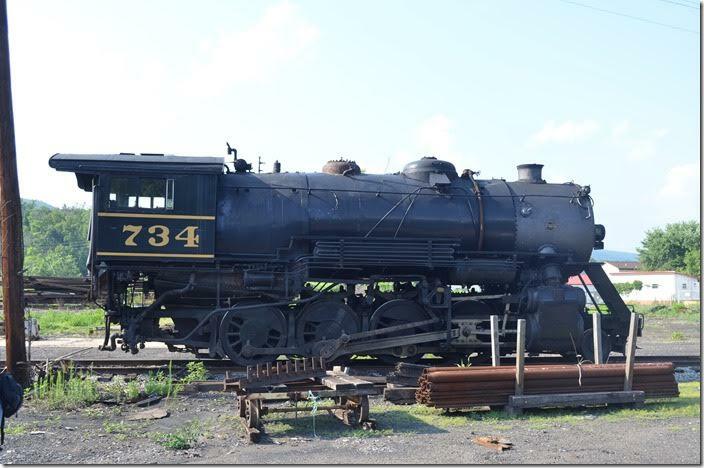 WMSR 734. View 9. 34. This is their Plymouth shop goat. WMSR Plymouth 7. 35. 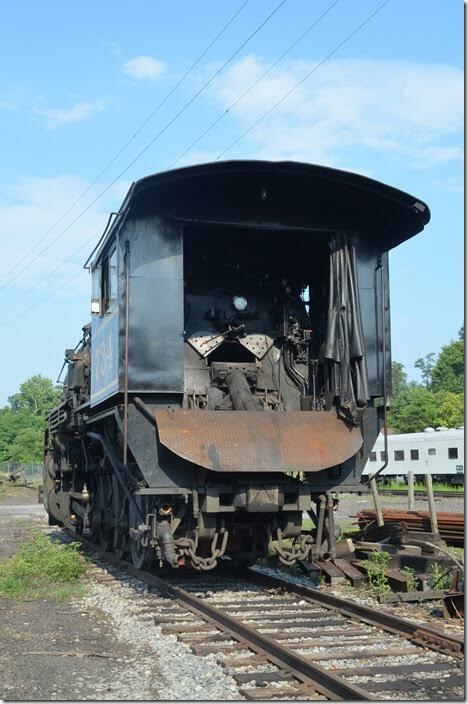 Note the “C&O”. WMSR 1309. 36. WMSR 1309. View 2. 37. WMSR 1309. View 3. 38. Our train is dead-headed back over to Ridgeley to be beded down for the night. 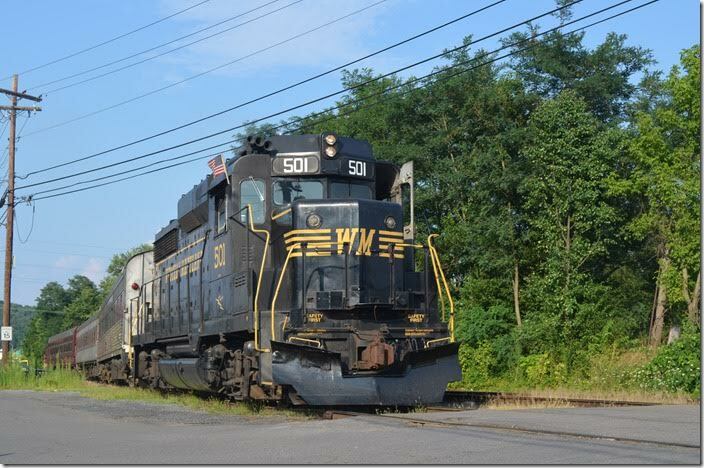 WMSR 501. 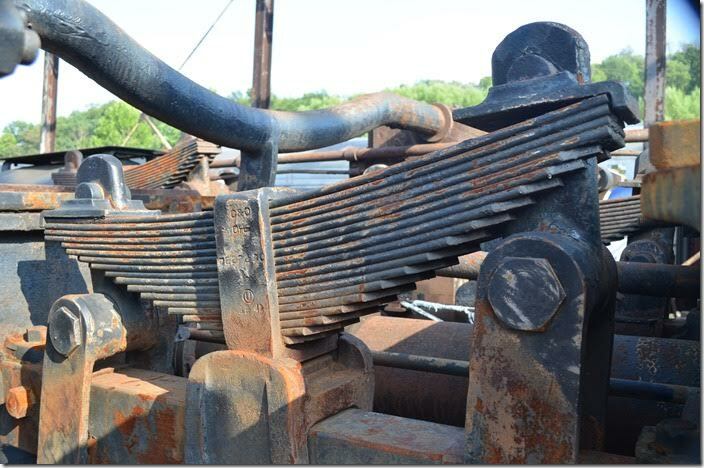 Ridgeley WV. 39. 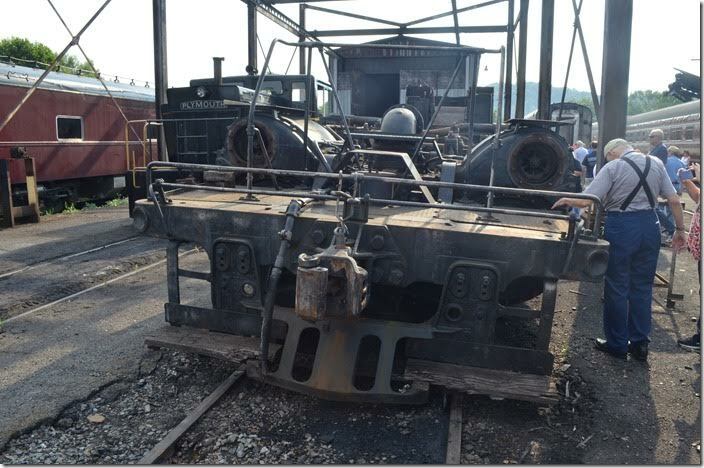 As you can see steam will not be running on the WMSR nor will the track to Frostburg be repaired until next year. 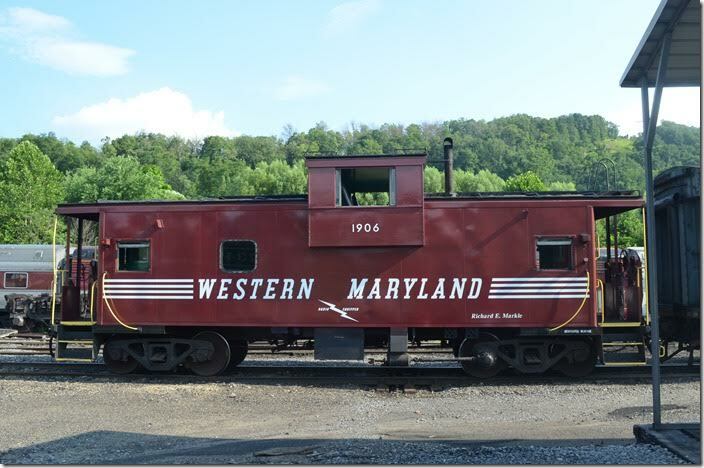 WMSR caboose 1906. Ridgeley WV.